Stuffed Poblano Peppers (Chiles Rellenos) Dig into this rich recipe! 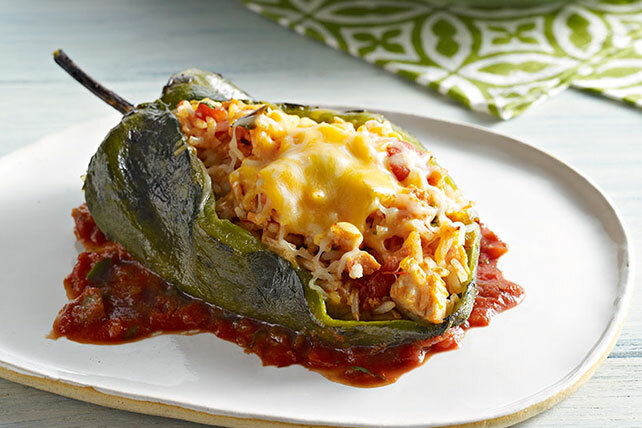 Large poblano peppers get a stuffing of chicken, cheese and chunky salsa and emerge from the oven hot, melty and delicious! Place chiles on foil-covered baking sheet. Broil, 4 inches from heat, 7 to 10 min. or until evenly blackened, turning occasionally. Transfer chiles to bowl; cover tightly. Let stand 20 min. or until cooled. Peel chiles; discard skins. Cut lengthwise slit in each chile, being careful to not cut through to opposite side. Remove and discard seeds. Heat oven to 350ºF. Mix salsa, cilantro and cumin in medium bowl until blended; spread half onto bottom of 8-inch square baking dish sprayed with cooking spray. Add chicken, rice and ¾ cup cheese to remaining salsa mixture; mix well. Spoon into chiles; place in prepared dish. Sprinkle with remaining cheese.